I know this isn’t your typical Hello, Spring! recipe for the first week of the new season… but spring sure is taking it’s sweet time to get here…. at least in Texas that is. The weather here lately has been down right erratic. 80 degrees one day. 30 degrees the next. And rainy. My god, so much rain. It has literally rained every weekend since we got to Austin. Five weekends of rain, people… in a city that’s supposedly in a drought. Some say we brought it with us. So to that I say, you’re welcome. So what better to go with our rainy damp days here than a bowl of creamy delicious soup that just so happens to be dairy-free too. When cooked throughly and blended, cauliflower takes on a creamy, smooth consistency. It’s great to use for a non-dairy cream-based soup or even a mash, as a substitute for mashed potatoes. Cauliflower is a cruciferous vegetable like broccoli, kale, cabbage, Brussel sprouts, etc. and like its cousins is full of antioxidants and nutrients like vitamin C, K, folate and manganese. It’s the leeks in this soup that make it say, “Hello, Spring!” A leek is a spring onion, which like the rest of its allium family (and crucifers too) is rich in sulfur – one of the most abundant minerals in the body and it’s required for hundreds of processes that keep us alive and kicking. Leeks are also one of nature’s antibiotics with strong anti-bacterial and anti-viral properties. Eating alliums (onions and garlic) regularly can help to ward of infection and keep your immune system strong. When preparing leeks, it’s the white part that you want to cook with. Cut off the green stems and remove the outer leaves. Cut off the end of the root and then slice again in half longways. Open up the leeks a bit to expose the inside pieces and rinse well under water. Cut again longways and then slice thinly. The thinner the strips, the faster they’ll cook. Place pot over medium heat and add olive oil. Saute the garlic and leeks about 3 minutes, until soft. Add cauliflower and saute for another minute. Add broth, then increase heat to high and bring to a boil. Reduce back to medium and simmer, covered for about 20-30 minutes, until the cauliflower can be pierced easily with a fork. 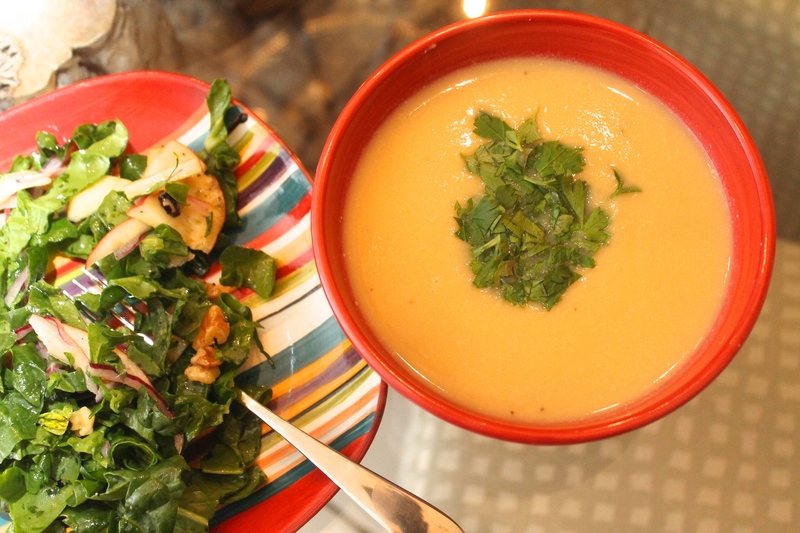 Blend soup either using a blender or immersion blender until smooth and creamy, with no lumps. Return to pot and warm over low heat. Add salt and pepper to taste. Serve garnished with chopped fresh parsley or chives.